Habitat’s Board of Directors has affirmed that sustainability is one of our core values. That’s why we are building homes that are energy-efficient, water conserving, and use materials that are less toxic and more environmentally sustainable. Our first LEED-certified home was completed in 2008. As of 2011, every single one of our homes meets a minimum of Earth Advantage certification standards. Fortunately, some funding partners are keenly interested in providing financial support to advance sustainable practices. The Home Depot Foundation partnered with Habitat for Humanity International starting in 2008 to launch the Partners in Sustainable Building (PSB) national program. The program reimburses affiliates $3,000 for each completed home that meets the Energy Star standard and $5,000 for homes that meet a more stringent standard like Earth Advantage or LEED, both of which incorporate additional benchmarks for air quality, moisture control and other green specifications. To date, over 2,100 Habitat homes nationally have received this funding support to help them meet green standards. This year, Habitat for Humanity Portland/Metro East is one of 125 Habitat affiliates across 38 states and the District of Columbia selected to participate in the PSB program. Between now and June 30, 2012, the affiliate can draw $5,000 per home on the first 15 new homes that we build and certify. But even when the Home Depot Foundation funds are gone, we are pledged to continue building to this standard. If you would like to support Habitat’s green building efforts with a financial or material donation, please contact Heather Gramp at 503-287-9529 x26. 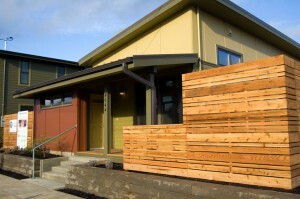 Our first LEED-certified home was completed in 2008. As of 2011, every single one of our homes meets a minimum of Earth Advantage certification standards.